A family member hands me her iPad, face lit up with eager excitement. She holds it in front of both of us, sidling up to me, watching me closely for a happy or grateful reaction — something to reinforce her discovery. Instead, she watches my face fall. On the screen are before and after pictures from surgeon’s offices, advertisements for gastric bypass and lap band surgeries. On the left, a woman my size, slouching and exposed, in fitted workout clothing. Next to her, that same woman, beaming and standing tall, half her previous size. I am before. I am always before. She pages through the pictures, watching my face for the happiness she’s sure will come. The relief she imagines when I learn that there is a way out of the body that I have — all it will take is $23,000 to cut that body open, truss its organs, and leave it to shrink itself. But in this moment, I have already been gutted. My ribcage has been hollowed out, heart and lungs set aside, cored like an apple. Breath scrapes in my throat before evaporating into the crater my ribs have become. I am awash in the desolation she imagines my life to be, and the wonderland she envisions for thinner women. The “after” women are her size. Still, she bemoans her own weight. I search the faces of the “before” women. They stare ahead, blank, stony, knowing that the bodies they have — the ones they are not meant to have — will live on in this photograph. They will forever be captured on film, looking like me. Later, the local TV news is on. A story about obesity airs. As the thin anchor warns of the dangers of bodies like mine, familiar B-roll plays. Fat torsos, holding hands. Fat thighs, walking down city sidewalks. Fat people, reduced to rolls and ill-fitting clothing, only and always filmed from the neck down. Familiar local landmarks and familiar bodies. I feel myself tense, muscles clenching and breath shallow. My forehead aches and I realize I’m squinting. Because the bodies on screen could easily be mine. B-roll of fat people is filmed surreptitiously, regularly gathered without the knowledge or consent of those captured on camera. The filming of that footage hurts us, but isn’t designed to — it simply disregards our experience. Producers need the footage, so camera operators gather it, and reporters narrate it. My body is shaped by their voices. In that moment, I become an epidemic. And it is unnecessary, especially when there are so many alternatives. Use footage of doctors talking with fat patients. Use video of fat people working out. Use data graphics. Use the same images, just angle the camera up slightly, include our faces, get our consent. Let us be recognized and recognizable. Remind viewers that fat people are not just aberrant, abhorrent bodies, but people who inhabit those bodies. Let them find some familiarity in our faces that they won’t find in our bodies. Let them see their mothers, brothers, neighbors, friends. Do anything but this. When we reduce fat people to our bodies, to “before and after,” or to bellies and rolls, we come to think of fat people as bodies without personhood. Fat bodies become symbols of disembodied disgust. And in a news report, at the very moment we are meant to be learning about fatness, the conversation isdevoid not only of the voices of fat people, but of our very faces. All of this happens on the news, meant to be an impartial, authoritative, informative discussion. Instead, it stokes the flames of revulsion. And when that happens in journalism, it cloaks that disgust as knowledge, incontrovertible and actionable. These images — flattened, inhuman — reinforce so much troubling thinking about fat people. Whether background visuals on the news or before & after photos in advertisements, we are more symbol than human. We become effigies, archetypes, morality tales, punchlines, threats, epidemics, but never just people. We are captured, pressed between pages like butterflies, forever frozen to illustrate our anatomies. We do not speak. We do not move. We are only & forever bodies. Images like those are what left me feeling so gutted with my family. 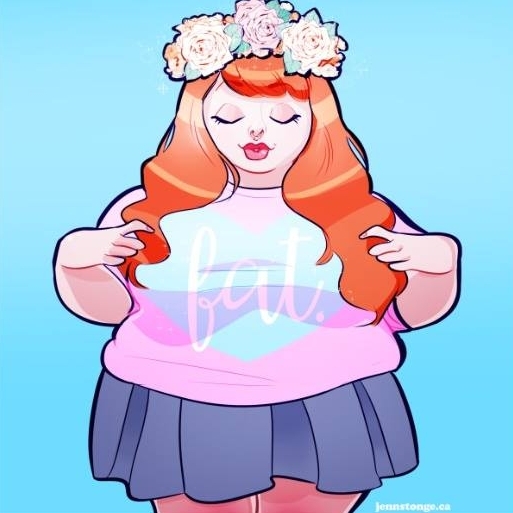 The onlytime fat people are afforded a voice or a face is when our bodies change, or when we express the grief, regret, guilt and shame that thin people imagine must come from having bodies like ours. What they do not consider is thecrumpling that happens when you see your body, every day, represented as a cautionary tale for someone else. If you are not careful, you may become a monstrosity like me. Before, desperately awaiting an after. Because after, you can be heard. After, you are not required to renounce your own body in order to be accepted and embraced. You may share your experiences, hopes, dreams, plans, without weighing them down with caveats, dress sizes, inches, or pounds. After, you can have a face. After, you can smile. After, you can speak. My body does not afford me those luxuries. My body is before. On a billboard, before. Neck down, before. Alone, before. When my doctor won’t see me, I cannot wish for better care. Instead, I am told to become an after — often by people who have never been fat. When a stranger shouts at me on the street, or when I am removed from an airplane, the answer remains the same. It’s simple: just spend years methodically constricting, willing your body to shrink. Face harsh treatment with your head held high until years later, when you are finally small enough. Then you will have earned the right to be seen,to be heard, to be believed. Doesn’t that help you today? Until then, I am held back at some invisible turnstile until I can will my body to change from what it has always been. When you see these images, dear friend, I need you to remember me. Remember my face, and the way it lights up when I see you. Remember the timbre of my voice. Remember what surprises you about me, and how you feel when we talk on the phone. Where billboards and B-roll flatten me, remember the fullness of me. When you see my parts, I need you to remember the sum of me. Like this post? There are more like it, including On “tough love” and your fat friend’s health and The divine liberation of calling myself fat. Nov 16 There are no right answers for your fat friend.